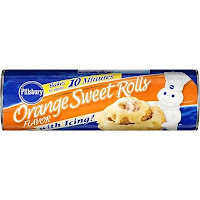 Pillsbury Orange Sweet Rolls are warm, fresh, and ready to serve in just minutes. With an ooey-gooey texture and a delicious orange icing, Orange Sweet Rolls have a mouth watering aroma that is sure to bring your family together like no other breakfast! Packed with the love and flavor of a treat made from scratch, but without the time and cleanup, Orange Sweet Rolls are the perfect addition to your family’s Sunday morning traditions. We think it might be fun for you to post a photo of one of your family’s sweet Sunday morning moments. Your photo may even have a chance to appear on the official Pillsbury website! As a member of my blog spark, I was lucky enough to receive a Pillsbury Orange Sweet Rolls gift pack that included a coupon for Pillsbury Orange Sweet Rolls as well as a photo album to help keep my family’s sweet Sunday morning memories close at hand. We have one Pillsbury Orange Sweet Rolls gift pack that includes a coupon for Pillsbury Orange Sweet Rolls and a photo album to give away to one lucky reader! Leave us a comment here at Pink Lemonade - share how your family enjoys Sunday mornings together or what your favorite childhood memories of Sunday morning breakfasts are. To recieve a special bonus entry - post the url to a picture of your family enjoying a sunday morning breakfast together! There you have it! Seven Eight very simple ways to enter our contest - how easy is that? Complete rules can be found on our Contest page. ~Please note that Pilsbury provided Pink Lemonade with a Pillsbury Orange Sweet Rolls gift pack through MyBlogSpark. we would always make homemade pancakes! I loved chatting with my Mom while helping her make a BIG breakfast! My favorite childhood memories of Sunday morning breakfasts is dad cooking for the whole family -- pancakes or waffles, bacon or sausage, fried or scrambled eggs, and hashbrowns :) *Thanks* for the giveaway! we love having cinnamon rolls and bacon for breakfast on sunday mornings. We love a big breakfast with Pancakes, scrambled eggs and bacon. Reading the Sunday paper and funnies together and then off to church. My husband makes waffles (from scratch!) every sunday and my boys love it. Thanks for the giveaway! Subscribed to feed on Google Reader. Sunday was always donut day. Sundays always means pancakes and bacon!